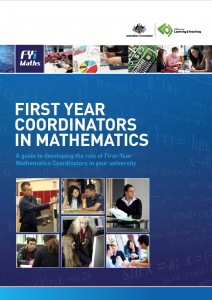 First Year Coordinators In Mathematics – A guide to developing the role of First-Year Mathematics Coordinators in your university is a print and PDF publication. The guide was produced for a Federal Government research consortium comprising academics from University of Melbourne, The University of Sydney, The University of Adelaide and Curtin University. As producer of the guide, I liaised with the academics to find out more about their research processes and to design a dissemination style and approach that would meet their needs. After several discussions we decided on something more colourful than a typical research report. The guide would take a very practical “how-to” approach that would summarise research findings in a friendly, engaging, practical and conversational way, whilst offering step-by-step advice. After initial design concepts and various proof-of-concept documents (developed with a design partner) I set milestones for content development and sourced a number of models, photographing them to illustrate the various case studies. Since the research, planning, content development and design took place over several years, I liaised a range of different project officers, academics, content experts and designers (final design and pre-press by Antonia from AOK Creative).